Type II water is routinely used for general lab use, feed water to analyzers, pre-treatment for Type I systems, and to wash and rinse glassware either manually or in the final rinse cycle of an automatic glassware washer. AQUA SOLUTIONS Type II reagent grade Lab Water Systems produce greater than 2 megohm-cm DI water that meets or exceeds ASTM, CAP and CLSI standards for Type II water. To eliminate the cost and inconvenience associated with traditional "Service DI" these Type II Laboratory Water Purification Systems are designed from the ground up to be user-installable and user-serviceable! They feature quick connect fitting, an easy to read purity light, and a spare DI tank. Single and Dual module versions are available for a variety of applications that require Type II DI water at flow rates of 5-12 LPM. They are also available as higher-flow, high-capacity "DW" systems for glassware washers that require flow rates of 20-40 LPM. 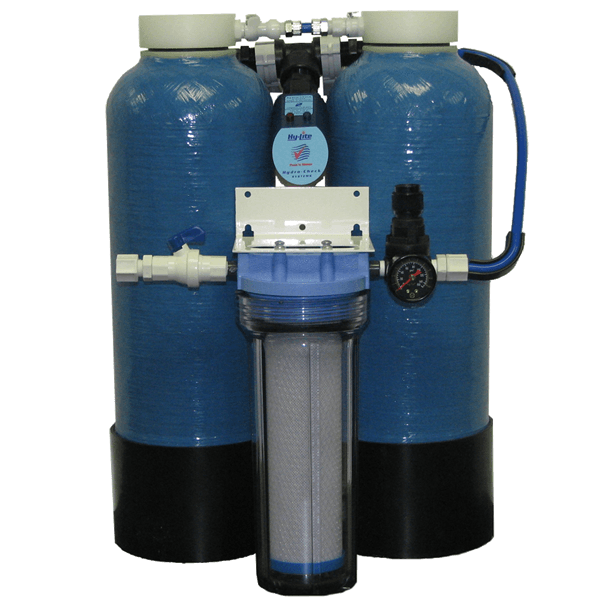 Our RODI systems include built-in reverse osmosis pre-treatment to lower operating cost and feature continuous recirculation to maintain maximum water purity. Please select one of the lab water systems listed below for detailed product specifications and additional information. You can narrow your search results by choosing specific system attributes in the "Refine your search" column on the left. I would like to request a quote for Type II Pure Water >2 Meg.